Observe that motion in two dimensions consists of horizontal and vertical components. Understand the independence of horizontal and vertical vectors in two-dimensional motion. Figure 1. 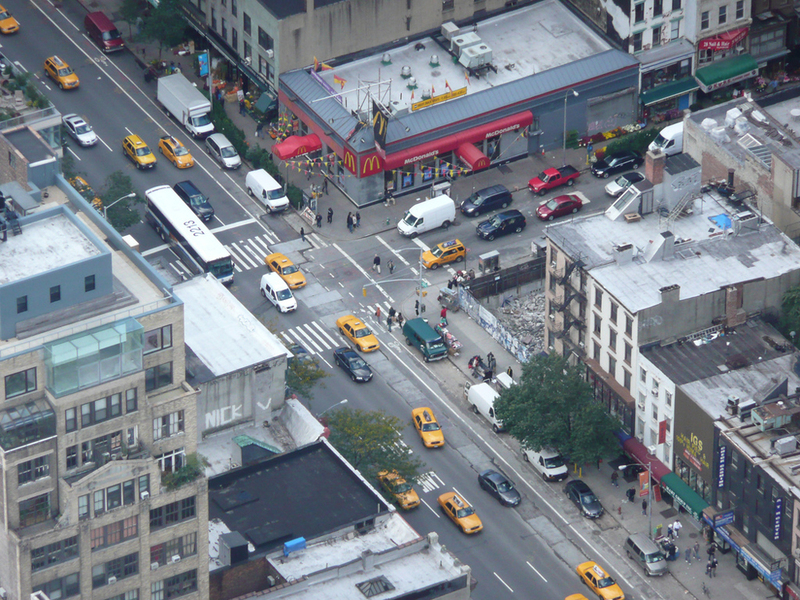 Walkers and drivers in a city like New York are rarely able to travel in straight lines to reach their destinations. Instead, they must follow roads and sidewalks, making two-dimensional, zigzagged paths. (credit: Margaret W. Carruthers). Suppose you want to walk from one point to another in a city with uniform square blocks, as pictured in Figure 2. Figure 2. A pedestrian walks a two-dimensional path between two points in a city. In this scene, all blocks are square and are the same size. The straight-line path that a helicopter might fly is blocked to you as a pedestrian, and so you are forced to take a two-dimensional path, such as the one shown. You walk 14 blocks in all, 9 east followed by 5 north. What is the straight-line distance? An old adage states that the shortest distance between two points is a straight line. The two legs of the trip and the straight-line path form a right triangle, and so the Pythagorean theorem, can be used to find the straight-line distance. Figure 3. 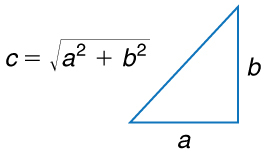 The Pythagorean theorem relates the length of the legs of a right triangle, labeled a and b, with the hypotenuse, labeled c. The relationship is given by: a2+b2=c2. This can be rewritten, solving for c: c = √(a2+b2). Figure 4. The straight-line path followed by a helicopter between the two points is shorter than the 14 blocks walked by the pedestrian. All blocks are square and the same size. The person taking the path shown in Figure 4 walks east and then north (two perpendicular directions). How far he or she walks east is only affected by his or her motion eastward. Similarly, how far he or she walks north is only affected by his or her motion northward. The horizontal and vertical components of two-dimensional motion are independent of each other. Any motion in the horizontal direction does not affect motion in the vertical direction, and vice versa. This is true in a simple scenario like that of walking in one direction first, followed by another. It is also true of more complicated motion involving movement in two directions at once. For example, let’s compare the motions of two baseballs. One baseball is dropped from rest. At the same instant, another is thrown horizontally from the same height and follows a curved path. A stroboscope has captured the positions of the balls at fixed time intervals as they fall. Figure 5. 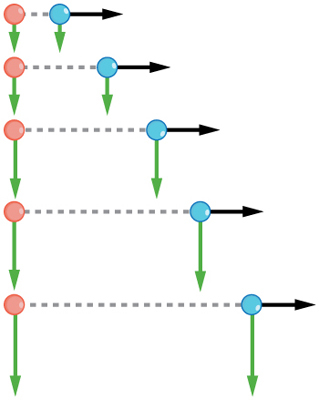 This shows the motions of two identical balls—one falls from rest, the other has an initial horizontal velocity. Each subsequent position is an equal time interval. Arrows represent horizontal and vertical velocities at each position. The ball on the right has an initial horizontal velocity, while the ball on the left has no horizontal velocity. Despite the difference in horizontal velocities, the vertical velocities and positions are identical for both balls. This shows that the vertical and horizontal motions are independent. It is remarkable that for each flash of the strobe, the vertical positions of the two balls are the same. This similarity implies that the vertical motion is independent of whether or not the ball is moving horizontally. (Assuming no air resistance, the vertical motion of a falling object is influenced by gravity only, and not by any horizontal forces.) Careful examination of the ball thrown horizontally shows that it travels the same horizontal distance between flashes. This is due to the fact that there are no additional forces on the ball in the horizontal direction after it is thrown. This result means that the horizontal velocity is constant, and affected neither by vertical motion nor by gravity (which is vertical). Note that this case is true only for ideal conditions. In the real world, air resistance will affect the speed of the balls in both directions. The two-dimensional curved path of the horizontally thrown ball is composed of two independent one-dimensional motions (horizontal and vertical). The key to analyzing such motion, called projectile motion, is to resolve (break) it into motions along perpendicular directions. Resolving two-dimensional motion into perpendicular components is possible because the components are independent. We shall see how to resolve vectors in Chapter 3.2 Vector Addition and Subtraction: Graphical Methods and Chapter 3.3 Vector Addition and Subtraction: Analytical Methods. We will find such techniques to be useful in many areas of physics. The shortest path between any two points is a straight line. In two dimensions, this path can be represented by a vector with horizontal and vertical components. The horizontal and vertical components of a vector are independent of one another. Motion in the horizontal direction does not affect motion in the vertical direction, and vice versa. 3.1 Kinematics in Two Dimensions: An Introduction by OpenStax is licensed under a Creative Commons Attribution 4.0 International License, except where otherwise noted.